Hours: Mon-Sun. 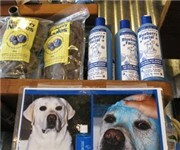 10:00 a.m. - 7:00 p.m.
How Would You Rate South Bark Dog Wash? 1. How dog friendly is it? 2. Is it clean and friendly for your dog?